This may have been the first time I made my recipe swap recipe the day I received my assignment. It was a Friday, which in our house is usually Homemade Pizza Night, and I didn’t have many ingredients on hand. I was trying to decide what to make when I thought, maybe I should peruse my assigned blog, Becoming Pigzilla, and see what Jen’s got cooking in there. Sure enough, she had a Buffalo Chicken pizza in there that looked amazing. So, I adapted it to use the shrimp I had left in the freezer, and Bella and I got cooking. I just want to jump in that picture and eat it all over again. Oh em gee. The garlic cream sauce that Jen recommends using is such a great touch. This is definitely going to be a staple in our house! Thanks once again to Sarah for hosting another great swap! Preheat oven to 500 degrees. Combine shrimp with hot sauce in a bowl. Roll out dough and place in oiled pan. 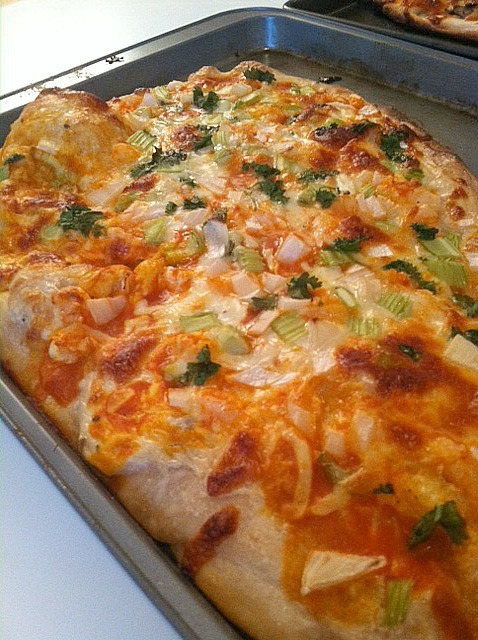 Spread garlic cream sauce over crust, followed by shrimp, onion, cheese and cilantro. Bake for 15 minutes. Remove from oven and top with celery and more hot sauce, if desired. Cut and serve. Melt butter and saute garlic over medium heat in a small saucepan. Cook until fragrant, about 2 minutes. Whisk in flour until it forms a thick paste. Slowly add milk while whisking. Increase heat to medium high until mixture begins to boil. Bring down to simmer, whisking constantly, until sauce reaches desired thickness. Remove from heat and add salt and pepper to taste. 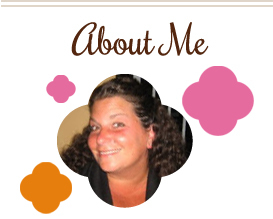 This entry was posted in garlic, main dishes, mozzarella, pizza, QuickAndEasy, sauce, shrimp. Bookmark the permalink. Oh wow, that looks like cheesy, garlicy goodness. YUM. I love buffalo-anything – and using shrimp sounds like a fabulous idea!! Homemade pizza really kicks @ss, huh? I LOVE that you used shrimp! Your pictures look so great! I really have to start making pizza earlier in the day – we always end up eating it so late that there is no good light. I suppose that’s an excuse to make more pizza!! So glad you liked it!